When you are signed in with your registered account you will see a "Save Portfolio" link under the portfolio asset allocation section of the results. Similarly if the portfolio is already saved or you have selected an existing saved portfolio, the section will refer to the saved portfolio name. The results section for Monte Carlo simulations and timing models will also include a corresponding link to save the related model. You can also save both portfolio backtest and timing model results as benchmarks. In the save dialog you can change the "Save As" option to "Benchmark", and you can then use the saved benchmark series as a comparison in any other model tests by selecting it from the benchmark list. The login menu in the top right hand corner provides the options to view and manage the list of saved models and benchmarks. You can click on the screenshots below to see the links in detail. Several tools such as efficient frontier and Monte Carlo simulation support the use of forward looking capital market expectations for asset returns and volatilities. 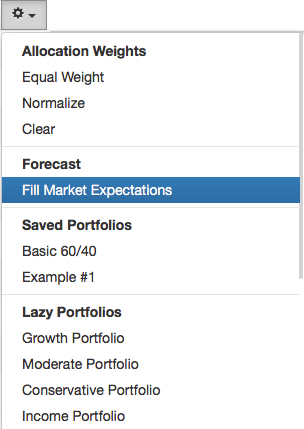 In the related preferences section you can save the capital market expectations for later use, which then easily allow you to populate them on the efficient frontier and Monte Carlo simulation screens by accessing the related dropdown menu entry as shown in the image below. You can import return series for use as a portfolio asset, risk factor or a benchmark. You can use the imported return series as an asset class, and you can also assign a custom ticker symbol for it to enable it to be used with any of the tools. To import a benchmark series access the login menu in the top right hand corner after signing in and select the "Import Benchmark" option to open the page for benchmark imports. 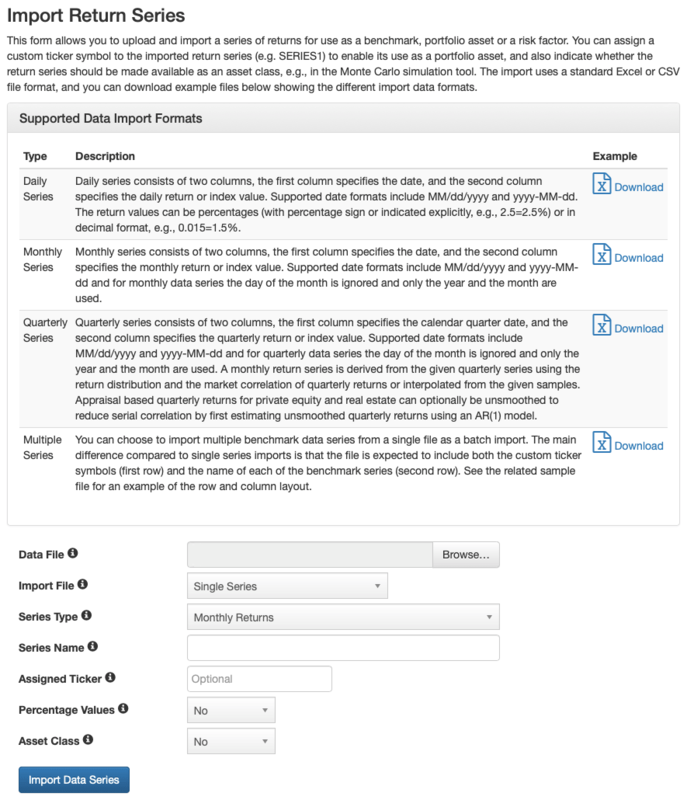 The import benchmark page provides options to download sample files showing the expected file layout for both monthly and daily data series, and the import can be done using either Excel or CSV file format. 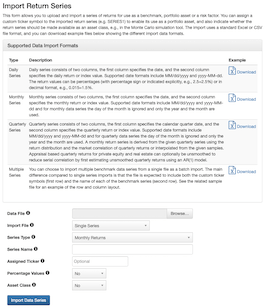 Below you can click the screenshot to see the import page in more detail and also download a sample file of monthly returns in the Excel format. You can import a portfolio for use with the tools. The import format requires two columns with the first column containing the ticker symbol for the asset and the second column containing either the balance or allocation weight for the asset. 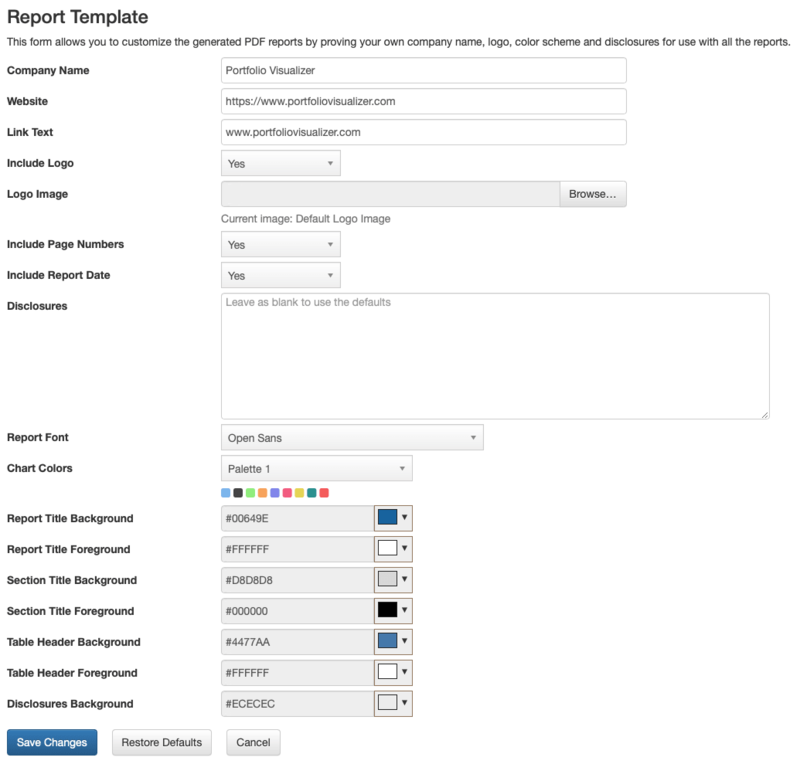 The import uses a standard Excel or CSV file format, and you can download a sample file from the import portfolio page. To import a portfolio access the login menu in the top right hand corner after signing in and select the "Import Portfolio" option to open the page for portfolio imports. The import portfolio option is also available directly on all portfolio entry pages in the associated dropdown menu (see the gear icon menu) for each portfolio allocation. 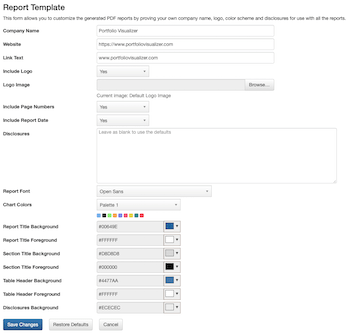 You can customize the report template to use your own company logo, disclosures, and color scheme in the generated PDF reports. The payment schedule for fees can be monthly, quarterly or annual. 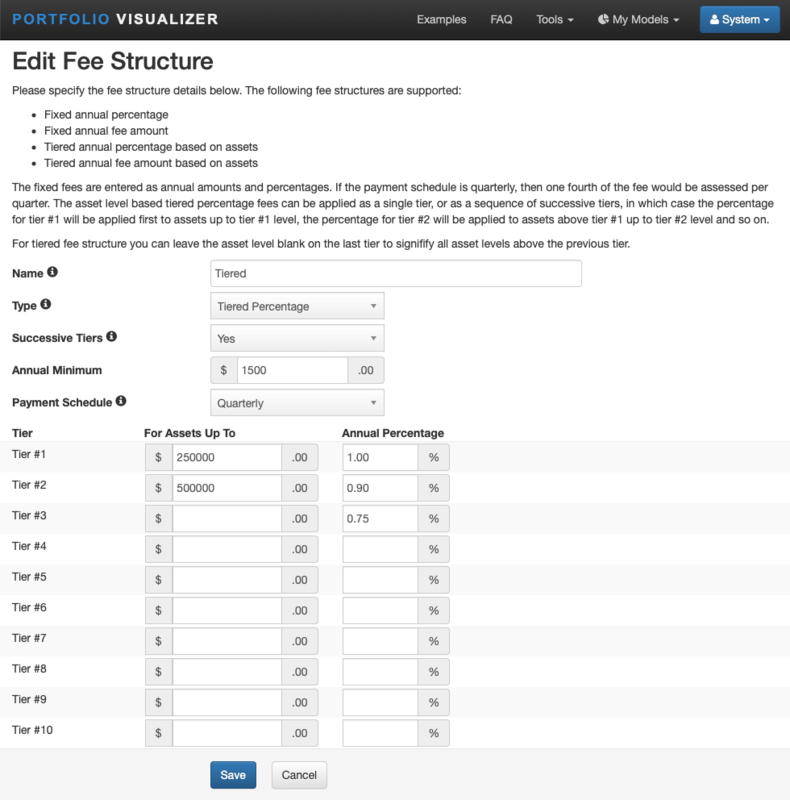 You can access and create fee structures on your preferences page. In portfolio backtesting fees are applied first before any scheduled withdrawals or contributions. 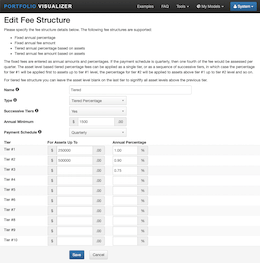 Note that the fee structure selection is only visible in portfolio backtesting if fee structures have been configured. The search icon next to the ticker entry fields (magnifying glass ) can be used to quickly locate ticker symbols based on asset name or type. The search box also helps identifying special tickers such as CASHX used for cash and ^GOLD used for gold price index. In most ticker entry fields you can also just type a partial name or a set of name components, e.g., "vanguard bond" to enable the ticker symbol lookup. The expense ratios of mutual funds and ETFs are captured in the fund share price, and the displayed performance calculated from the adjusted close prices accounts for the fund expense ratio. This SEC publication provides more information on how the mutual fund share prices are calculated and how any fees are handled. All returns for long positions are based on total return including dividends and capital gains distributions. Short positions can be entered by specifying a negative allocation weight for the shorted assets. This section provides additional technical information and clarifications regarding the tools to address common questions. The asset allocation backtesting tool uses asset class return data to backtest simulated portfolio returns. The asset allocation backtesting tool calculates portfolio returns (end balance, CAGR, IRR), risk characteristics (standard deviation, Sharpe ratio, Sortino ratio, maximum drawdown), and rolling returns based on monthly data. The risk free rate is based on historical 1-month treasury bill return data from Professor Kenneth French's data library. Inflation adjusted returns, withdrawals and contributions are based on the CPI-U data from the Bureau of Labor and Statistics. Internal rate of return (IRR) is shown for portfolios with periodic withdrawals or contributions. By default the simulated portfolio is rebalanced annually. Asset allocation drift data is displayed under the results section if rebalancing is disabled. Calendar based rebalancing can also be set to monthly, quarterly, or semi-annual frequency. Rebalancing bands are also supported, and the default rebalancing bands are based on 5% absolute deviation from the target allocation (large allocations), or 25% relative deviation from the target allocation (small allocations). If the target allocation for an asset is 60%, then the absolute deviation threshold would trigger rebalancing when the asset's weight in the portfolio hits 65% or 55%. If the target allocation for an asset is 10%, then the relative deviation threshold would trigger rebalancing when the asset's weight in the portfolio hits 12.5% or 7.5%. The portfolio backtesting tool calculates portfolio returns (end balance, CAGR, IRR) based on monthly asset returns. Risk characteristics (standard deviation, Sharpe ratio, Sortino ratio) are calculated from monthly returns and annualized, and maximum drawdown is calculated from monthly portfolio balances. The portfolio backtesting tool tool uses total return data for the specified mutual funds, ETFs and stocks, and assumes by default that all dividends and capital gains distributions are reinvested. The risk free rate is based on historical 1-month treasury bill return data from Professor Kenneth French's data library. Inflation adjusted returns, withdrawals and contributions are based on the CPI-U data from the Bureau of Labor and Statistics. Internal rate of return (IRR) is shown for portfolios with periodic withdrawals or contributions. By default the simulated portfolio is rebalanced annually. Asset allocation drift data is displayed under the results section if rebalancing is disabled. Calendar based rebalancing can also be set to monthly, quarterly, or semi-annual frequency. Rebalancing bands are also supported, and the default rebalancing bands are based on 5% absolute deviation from the target allocation (large allocations), or 25% relative deviation from the target allocation (small allocations). If the target allocation for an asset is 60%, then the absolute deviation threshold would trigger rebalancing when the asset's weight in the portfolio hits 65% or 55%. If the target allocation for an asset is 10%, then the relative deviation threshold would trigger rebalancing when the asset's weight in the portfolio hits 12.5% or 7.5%. Minimize Conditional Value-at-Risk – Conditional Value-at-Risk (CVaR), also known as expected shortfall and expected tail loss, considers the downside part of the portfolio return distribution. Optimizing the portfolio to minimize Conditional Value-at-Risk finds the portfolio with the smallest expected tail loss. For the purposes of optimization the left tail is defined as the bottom 5% of returns and the optimization minimizes the 5%-quantile expected shortfall. Maximize Sortino ratio – This portfolio optimization strategy finds the portfolio that maximizes the Sortino ratio for the given minimum acceptable return. The Sortino ratio measures the risk-adjusted return of a portfolio, or strategy, but unlike the Sharpe ratio, it only penalizes for returns falling below the target return, whereas the Sharpe ratio penalizes both upside and downside volatility equally. The optimizer uses differential evolution algorithm for optimizing minimum drawdown and maximum Sortino and Omega ratios. The results from the evolutionary algorithm for non-convex optimization may vary slightly between optimization runs depending on convergence to global optimum. 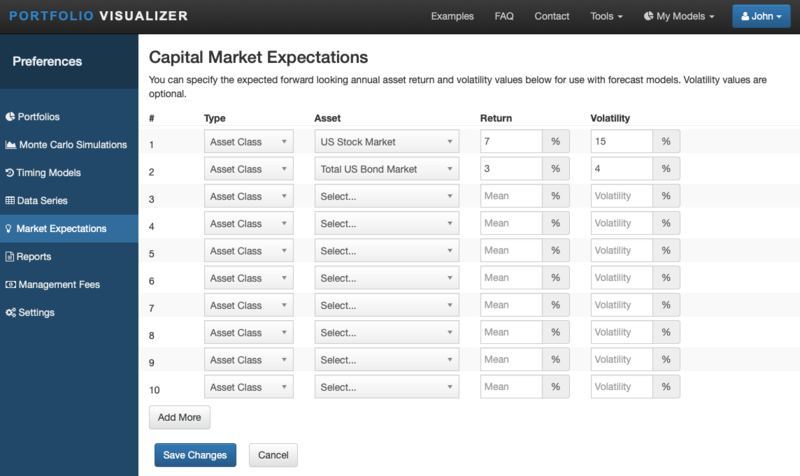 The Black-Litterman asset allocation model combines ideas from the Capital Asset Pricing Model (CAPM) and the Markowitz’s mean-variance optimization model to provide a a method to calculate the optimal portfolio weights based on the given inputs. The model first calculates the implied market equilibrium returns based on the given benchmark asset allocation weights, and then allows the investor to adjust these expected returns based on the investor's views. The opinion adjusted returns are then passed to the mean variance optimizer to derive the optimal asset allocation weights. The Black-Litterman model supports both absolute views (expected return for the given asset) and relative views (asset #1 will outperform asset #2 by X), and addresses many of the shortcomings of mean-variance optimization, which often results in concentrated portfolios based on past asset performance. Historical Returns - Simulates future returns by randomly selecting the returns for each year from the database of available historical returns (empirical sampling). Using a single year as the bootstrapping model retains the cross asset correlations for the configured portfolio allocation for each simulated year and avoids overweighting any specific year. Using block bootstrapping selects a random sequence of annual returns and better captures the serial correlation and mean reversion of assets. Block bootstrapping may overweight the central periods unless circular block bootstrapping is used, in which case the year range for the block sequence is allowed to wrap around, e.g., selecting a 10-year block with random start year of 2010 would first use returns from 2010-2014 and then wrap around to 1972-1976. At least 10 full years of data for selected portfolio assets is required for this simulation model, and the portfolio assets are assumed to be rebalanced annually. The inflation for each simulated year is based on the selected historical year's inflation rate. Statistical Returns - Simulates future returns for portfolio assets based on each assets historical mean and standard deviation, and the correlation of the assets. This model uses Cholesky decomposition to generate multivariate correlated normal samples based on the historical statistics. At least 5 full years of data for selected portfolio assets is required for this simulation model, and the portfolio assets are assumed to be rebalanced annually. The inflation for each simulated year is based on either historical data, or user provided distribution. The inflation samples are created so that inflation correlation with simulated portfolio assets is preserved. Forecasted Returns - Simulates future returns for portfolio assets based on the user provided mean and standard deviation of assets combined with historical or imported asset correlations. This model uses Cholesky decomposition to generate multivariate correlated normal samples based on the user provided parameters. 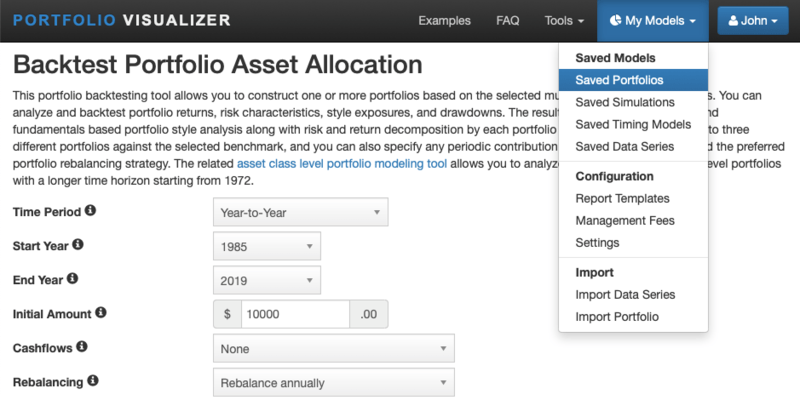 At least 5 full years of data for selected portfolio assets is required for this simulation model, and the portfolio assets are assumed to be rebalanced annually. The inflation for each simulated year is based on either historical data, or user provided distribution. The inflation samples are created so that inflation correlation with simulated portfolio assets is preserved. Parameterized Returns - Simulates future returns based on the specified statistical distribution with the given mean and standard deviation. The supported distributions include normal distribution, and a fat-tailed Student's t-distribution. The inflation for each simulated year is by default based on normal distribution matching the historical annual CPI-U data mean and standard deviation. Alternatively the mean and standard deviation for inflation can be specified explicitly. Periodic contributions and withdrawals are supported, and the amounts can be adjusted for the simulated inflation. For withdrawals the tool also supports withdrawing a fixed percentage from the portfolio periodically, or withdrawing a variable percentage based on remaining life expectancy. Fixed percentage based withdrawals can be smoothed with spending rules. Rolling average spending rule calculates the withdrawal amount as a percentage of the rolling average portfolio balance, and geometric spending rule calculates a weighted sum of the prior period's spending level adjusted for inflation and the percentage of the current portfolio balance where the former is multiplied by the smoothing rate and latter by one minus the smoothing rate. For life expectancy based withdrawals the current age is a required parameter, and the age is assumed to increased by 1 before the end of the first simulated year, i.e., if the current age is 70, then the first year's withdrawal is based on remaining life expectancy at age 71. If the withdrawal frequency is not annual, then the percentage is adjusted automatically, e.g., quarterly withdrawals would use one quarter of the annual percentage amount (one divided by remaining life expectancy). Life expectancy tables are based on IRS Publication 590-B. For percentage based withdrawals the tool displays the withdrawals both in nominal dollars and in present dollars per the simulated inflation model. The simulation model supports testing for the sequence of returns risk. The sequence of returns risk is the risk of receiving poor returns early in a period when withdrawals are taken from a portfolio, e.g., when starting retirement. These poor early returns may cause the portfolio to be depleted much faster than expected based on historical averages. The stress testing model allows the user to specify the number of years of poor early returns, and the simulated return series is adjusted so that the worst returns occur upfront. For example, if the sequence of generated returns is [1%, 5%, -2%, -7%, 4%], then stress testing for 1 poor return upfront would adjust the return series to [-7%, 1%, 5%, -2%, 4%], and stress testing for 2 poor returns upfront would adjust the return series to [-7%, -2%, 1%, 5%, 4%]. The efficient frontier is a concept in modern portfolio theory introduced by Harry Markowitz in 1952. The efficient frontier tool shows the return and risk curve for the mix of the selected assets that minimizes the portfolio risk measured by volatility for the given expected return. The tool also supports rendering the geometric mean efficient frontier, which addresses the single period nature of traditional mean variance optimization by displaying the expected portfolio growth rate in a multi-period context, where the return is given by the geometric rather than the arithmetic mean. Since the arithmetic mean of any return series is always greater than the geometric mean, the return predicted by the Markowitz efficient frontier is always greater than the true long term return that would have been obtained by using the actual rebalanced allocation. Efficient frontiers can be constructed based on historical returns, or forecasted returns for and volatilities. Forward-looking efficient frontier portfolios are based on the user-specified expected returns and volatility combined with historical asset correlations. Javier Estrada - Geometric Mean Maximization: An Overlooked Portfolio Approach? The asset correlation tool computes the Pearson correlation for the selected assets based on daily, monthly or annual asset returns. The tool also shows the annualized return for the selected assets based on the compound annual growth rate formula and the selected asset return series. Monthly standard deviation is calculated based on full calendar months within the time period for the selected tickers. Term and credit risk based 2-factor model where the term risk premium is calculated as the difference between long-term treasuries and treasury bills and the credit risk premium is calculated as the difference between long-term corporates and long-term treasuries. This model is not adjusted to account for the differences in the interest rate sensitivities of long-term treasuries and corporate bonds (refer to the Hallerbach and Houweling, and Asvanunt and Richardson papers listed below). Term and credit risk based 2-factor model where the term risk premium is calculated as the difference between long-term treasuries and treasury bills and the credit risk premium is calculated from the long-term corporates and long-term treasuries while accounting for the differences in the interest rate sensitivities of long-term treasuries and corporate bonds (refer to the Hallerbach and Houweling, and Asvanunt and Richardson papers listed below). Term and credit risk based 4-factor model where term factor is split to intermediate term (intermediate term treasuries minus the risk free rate) and long term (long minus intermediate term treasuries) interest rate risk factors, and high yield credit risk (high yield corporates minus intermediate term treasuries adjusted for interest rate sensitivity) is added as an additional credit risk factor in addition to the credit risk premium calculated from the long-term corporates and long-term treasuries while accounting for the differences in the interest rate sensitivities of long-term treasuries and corporate bonds (refer to the Hallerbach and Houweling, and Asvanunt and Richardson papers listed below). The factor regression tool supports the use of robust standard errors based on the Newey–West estimator. The estimator can be used to try to overcome autocorrelation and heteroscedasticity of the residuals, which can impact the standard errors and thus the calculated t-statistics and p-values. Note that historical equity factor returns are sometimes revised based on changes to CRSP database. Examples include updating and correcting the number of shares outstanding in past periods and changes in the treatment of deferred taxes described in FASB 109, i.e., factor returns published after August 2016 no longer add Deferred Taxes and Investment Tax Credit to BE for fiscal years ending in 1993 or later. 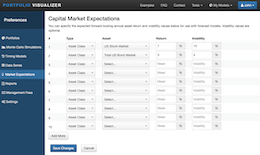 The factor exposure matching tool enables testing whether the factor exposures and performance of the given asset can be replicated using other available assets, e.g., by using cheaper and more widely available funds or ETFs with same factor exposures and performance rather than investing in a more expensive product. The tool computes the factor exposures of the target asset using the specified factor model and time period, and then explores the combinations of the given alternative assets to find the closest match. The factor matching can be weighted equally, in which case the tool tries to minimize the sum square of factor loading differences for statistically significant factors, or based on t-stat, in which case the absolute t-stat value of the factor loading is used to weight the squared differences to prioritize matching based on the most significant factors. The tool also displays the closest match based on straight performance matching for comparison purposes. The straight performance matching is based on a combination of alternative assets that minimizes the sum square of monthly return differences. This model compares a baseline balanced portfolio (60% stocks, 40% treasury notes) with a portfolio that adjusts the stock and bond allocation based on the market valuation. The baseline portfolio is rebalanced annually, and the timing portfolio adjusts its allocation at the start of each year based on the Shiller PE10 ratio. The allocation changes to the timing portfolio are based on market valuation differing significantly from PE10 value of 18 (PE10 average since 1950). Moving average model uses the crossover of the moving average with the price or another moving average to decide whether to invest in the given asset. If the end-of-period price is greater than or equal to the moving average, the model will invest in the selected asset (risk on). If the end-of-period price is less than the moving average, the model will invest in an alternative safe asset, e.g., cash (risk off). Alternatively the crossover of price and moving average can be replaced with the crossover of two moving averages, typically using a shorter term moving average being higher than the longer term moving average as the buy signal. The moving average is calculated from adjusted close prices either based on end-of-month prices for monthly moving averages or daily prices when the moving average is specified in trading days. The start year of the timing model backtest is adjusted forward if necessary so that there is enough historical data to trigger the timing signal from the start of the timing period. Trades are performed at either the end-of-period close price, or at next trading day's close based on defined trading policy. The delayed trading accounts for the fact that typically in practice one would not be able to execute the trade at the point in time when the signal becomes available. Single Period - Single period model uses one timing window to calculate each asset's past performance. The calculated performance number is the asset's total return over the timing period. The calculated performance number can be volatility adjusted, in which case the model adjusts the asset return performance by calculating the average daily return over the timing period divided by the standard deviation of daily total returns over the volatility window period. The cash ticker (CASHX), if used, is excluded from the volatility adjustment. Multiple Period - This model uses multiple weighted timing periods. The model first calculates the relative performance of the assets for each timing period based on total return, and then weights either the rankings or the asset performance based on user supplied weights for the timing periods. When assets are ranked by performance across multiple timing windows, you can specify whether the returns are normalized (e.g. average daily return), or whether the total return over the whole timing period is used. If weighted rankings are used and two or more assets have the same weighted rank, then the performance or volatility window with the largest weighting determines the order. If the window weights are also equal, then the first specified time window is used to break the tie. Volatility can be used as an additional negative ranking factor, i.e., the asset with the lowest volatility is ranked first for the volatility window. Volatility calculations are based on the standard deviation of daily total returns. Both models above also support moving average based risk controls, which allows the relative strength model selections to be overridden so that the model invests in cash instead of the asset if the price of the asset is below its moving average. The moving average is calculated as described above. The start year of the timing model backtest is adjusted forward if necessary so that there is enough historical data to trigger the timing signal from the start of the timing period. The months in the timing period are calendar months, and monthly changes are based on the end-of-month adjusted close price. Trades are performed at either the end-of-period close price, or at next trading day's close based on defined trading policy. The delayed trading accounts for the fact that typically in practice one would not be able to execute the trade at the point in time when the signal becomes available. The dual momentum model combines relative momentum and absolute momentum based timing. Relative strength is used to select the best performing model asset(s) and absolute momentum is then applied as a trend-following filter to only invest in the selected asset(s) if the excess return over the risk free rate has been positive. If the excess return is negative, then the model invests in short- to intermediate-term fixed income instruments (the out-of-market asset) until the trend turns positive. The relative momentum performance is calculated as the asset's total return over the timing period, and the return of 1-month treasury bills is used as the risk free rate for the absolute momentum filter. The months in the timing period are calendar months, and monthly changes are based on the end-of-month adjusted close price. Trades are performed at either the end-of-month close price, or at next trading day's close based on defined trading policy. The delayed trading accounts for the fact that typically in practice one would not be able to execute the trade at the point in time when the signal becomes available. Rapach and Strauss and Zhou (2013) find that the US stock market leads the world markets even at the monthly frequency, so the supported options include specifying a single asset to be used for absolute momentum. As discussed in Gary Antonacci's Dual Momentum book, we can first apply absolute momentum based on the US stock market (e.g. S&P 500 TR) and assuming the excess return over the risk free rate is positive, we use relative momentum to choose between US equity and international equity. If the absolute momentum excess return is negative, the model is invested in the selected out-of-market asset, e.g., Barclays U.S. Aggregate Bond Index. The adaptive asset allocation model combines relative strength momentum model with different asset weighting. The relative strength model uses an equal weight allocation for the model selected assets, whereas the adaptive asset allocation uses either risk parity allocation or minimum variance allocation for the model assets, i.e., it either equalizes the risk contribution across the selected assets or weights the assets in order to minimize the expected volatility. Both the relative strength momentum timing period and the period for daily volatility and return calculations can be specified. The default model uses 6-month relative momentum with 60-day volatility window. The target volatility model uses dynamic asset allocation to achieve a stable level of volatility. The model manages volatility by forecasting future equity volatility based on historic realized volatility and then dynamically adjusts the market exposure to target a set level of volatility. The historic realized volatility calculation assumes that the given portfolio allocation is maintained (no adjustment for asset allocation drift). The model calculates the realized portfolio volatility (annualized daily volatility) based on daily total returns, and then either increases or decreases the equity exposure of the portfolio to maintain the target risk level. If the predicted volatility of the portfolio is above the set target level, the model shifts assets to a risk free asset, typically cash, so that the predicted volatility is in line with the target volatility. For example, if the target annual volatility is 4% and the realized volatility is 6%, then the portfolio asset weights are multiplied by 40/60 and the remaining assets are allocated to the selected risk free asset. The strategy aims to sell assets when their risk-adjusted expected return is falling (rising market volatility) and buying equities when their risk-adjusted expected return is rising (falling market volatility) to provide better risk-adjusted portfolio returns and to account for investor's risk tolerance. However, volatility targeting tends to reduce equity exposure after a sharp market drop, which means the portfolio may miss the early part of the market recovery. The data sources for factor analysis are listed below. The data sources for monthly asset class returns are listed below. The table of annual asset class returns shows the calculated annual returns based on the data sources below. You can also import a custom return series to be used as an asset class, as a portfolio asset or as a benchmark. Historical data for annual asset class returns is not 100% reliable and authoritative sources often differ on exact returns for a particular investment. Typical differences for historical asset class returns based on the data source are below 50 basis points. Data for U.S. and Canadian securities, mutual funds, and ETFs is provided by Morningstar Inc and Commodity Systems Inc. The capital gains and dividends for ETFs and mutual funds are typically reflected within two business days of the ex-dividend date. If you note a specific data error, please use the contact form to report it.